← How do health care providers understand the social basis of conscience? This post is a part of our Bioethics in the News series. For more information, click here. In February 2013 while visiting the University of California-Riverside, I presented a program on how to best prepare for medical school. As Assistant Dean for Admissions, I’d given this talk numerous times, and as such felt comfortable addressing questions from premed audiences. It was at that point I encountered a moment of awkwardness…. I’d previously addressed questions about citizenship on many occasions, but never quite in the context of the question at hand. Thoughts began to race through my head… “Undocumented, as in illegal alien? Attending our colleges and universities? Really?” I suddenly suspected that the response that CHM will only consider US citizens, Canadians, and permanent residents wasn’t the answer this student (and perhaps a few others) was looking for. It then hit me that there is something going on in American higher education that I was not aware of. I needed an education about this, and quick! Image Description: a handmade sign reads “Education Not Deportation” in red and black writing. Source: Flickr Creative Commons. Throughout the early 21st century, Congress attempted numerous times to pass the DREAM Act (Development, Relief, and Education for Alien Minors). Its intent was to provide protection from deportation of individuals who had come to the US illegally as children (under the age of 15), graduated from a US high school or received their GED, and had lived here continuously for at least 5 years. On August 15, 2012, US Citizenship and Immigration Services started accepting applications under executive order of the President for his new Deferred Action for Childhood Arrivals (DACA) program, in which qualifying individuals are given legal renewable protection from deportation every two years. To qualify, applicants must: arrive to the US before age 16; live here continuously since July 15, 2007; be under age 31 in June 2012; demonstrate completion of high school or a GED; and be without conviction of a felony or serious misdemeanor. Most DACA enrollees come from Mexico and other Latin American countries. Approximately 2 million people qualify or potentially qualify for DACA, most living in California and Texas. In Michigan, approximately 15,000 people would potentially qualify or have enrolled for DACA. DACA enrollees can get a driver’s license, work permits, and social security numbers (meaning that they can pursue medical residency and become employed). They can take the MCAT and all US medical licensing exams. In states with the highest numbers of undocumented DACA potentials, there are no laws prohibiting their medical licensure. 65,000 undocumented students graduate from high school annually. The right to this education was granted in 1982 when the Supreme Court ruled that undocumented children could not be denied a K-12 education. It is less clear how many undocumented students attend college. Estimates in California suggest that 10-20% of undocumented students who graduate from high school enroll in college. With a national graduation rate of 59%, this would translate into roughly 3,800—7,600 undocumented college graduates nationally. In many states, immigrant youth have worked hard to pass in-state tuition bills at their respective public colleges and universities. California and Texas have been able to pass bills granting access to state financial aid. And Illinois has passed a bill creating a state-run private scholarship fund. Federal loans, though, are not available. According to the Undocumented Student Guide to College, the following schools are considered DACA-friendly: Western Michigan University, Michigan Technological University, Hope College, University of Detroit, Eastern Michigan University, Olivet College, Marygrove College, and Grand Valley State University. Eastern Michigan University, Wayne State University, and the University of Michigan recently began offering in-state tuition to undocumented students meeting Michigan residency requirements. Michigan State University does not offer in-state tuition to undocumented or DACA enrolled matriculants. Michigan State University’s College of Human Medicine is committed to educating exemplary physicians and scholars, discovering and disseminating new knowledge, and providing service at home and abroad. We enhance our communities by providing outstanding primary and specialty care, promoting the dignity and inclusion of all people, and responding to the needs of the medically underserved. I believe it is no mistake that “responding to the needs of the medically underserved” is the last component of our mission—it leaves a lasting impression. 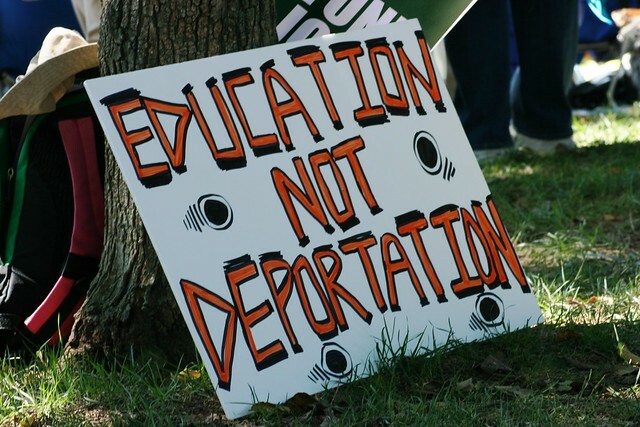 Undocumented students are civically engaged and give back to their communities. Coming from underrepresented backgrounds in medicine, they are likely to return to their communities—low income, doctor shortage areas—and serve as primary care physicians. Immigration remains highly problematic and politicized. And my point is not to initiate commentary about how to solve the problem of illegal immigration by those who were brought to our country as children beyond their own will, raised in American society, speak the dominant language, and educated in our public schools. My personal ethics, though, compel me to want to help these people if for no other reason than their personal merits and potential to our society (or even for what I believe is our profession’s duty of beneficence and the value of social justice). I have since received a handful in inquiries from DACA students in Michigan asking us to accept their application to medical school. If we believe that DACA enrollees possess value in our society, giving them the opportunity to apply to medical school is the first step in recognizing this potential. If we continue the status quo, we risk trying to defend a mission statement in light of an admissions policy that is selective and rejects inclusiveness. If we change our current policy, we risk scrutiny and support from certain aspects of the public. The issues are complex to say the least. Shouldn’t we, though, as a college and institution be grappling with this? It appears that others in Michigan have (and are moving onward). At a minimum, this is an issue that we can no longer ignore. I hope that our institution is having this conversation. If asked, I know what position I and my conscious would take. American Immigration Council. Who and Where the Dreamers Are: Revised Estimates. October 2012. http://www.immigrationpolicy.org/just-facts/who-andwhere-dreamers-are-revised-estimates. Balderas-Medina Anaya Y, del Rosario M, Doyle LH, Hayes-Bautista DE. Undocumented students pursuing medical education: The implications of Deferred Action for Childhood Arrivals (DACA). Academic Medicine. 2014 Dec; 89(12):1599-602. http://www.ncbi.nlm.nih.gov/pubmed/25093382. Foley, Elise. Obama Moves To Protect Millions From Deportation. Huffpost Politics. Huffington Post, 20 Nov. 2014. http://www.huffingtonpost.com/2014/11/20/obama-immigration-plan_n_6178774.html. Greenberg, Rebecca. AAMC Extends Fee Assistance Program to Students With DACA Status; Admissions Policies Open Doors. Association of American Medical Colleges. Oct. 2014. https://www.aamc.org/newsroom/reporter/412110/fee-assistance.html. Kuczewski MG, Brubaker L. Medical education for “Dreamers”: Barriers and opportunities for undocumented immigrants. Academic Medicine. 2014 Dec; 89(12):1593-8. http://www.ncbi.nlm.nih.gov/pubmed/25093382. Long, Katherine. UW Medical School to Allow Nonlegal Residents. The Seattle Times.30 Sept. 2014. http://www.seattletimes.com/seattle-news/uw-medical-school-to-allow-nonlegal-residents/. Michigan State University College of Human Medicine website at http://humanmedicine.msu.edu/About/Mission.htm. Schorsch, Kristen. A Year Later, Loyola Still Alone in Enrolling Undocumented Students. Crain’s Chicago Business9 Aug. 2014. http://www.chicagobusiness.com/article/20140809/ISSUE01/308099984/a-year-later-loyola-still-alone-in-enrolling-undocumented-students. Joel Maurer, MD, is Assistant Dean of Admissions in the College of Human Medicine and Associate Professor in the Department of Obstetrics, Gynecology and Reproductive Biology at Michigan State University. All opinions expressed in this article are his own. Join the discussion! Your comments and responses to this commentary are welcomed. The author will respond to all comments made by Thursday, April 9, 2015. With your participation, we hope to create discussions rich with insights from diverse perspectives. You must provide your name and email address to leave a comment. Your email address will not be made public. This entry was posted in Bioethics in the News and tagged DACA, DREAM Act, higher education, Medical School, undocumented students. Bookmark the permalink.